Everyone wants to spend as much time as possible enjoying their outdoor patio area. When the weather turns chillier, a patio heater for your outdoor living space is a great option. Patio heaters are a wonderful option to continue to enjoy the benefits of the outdoors even when the weather turns cooler. 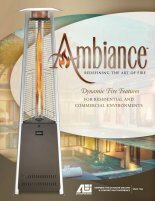 Backyard Expressions stocks the latest in outdoor heaters for your patio or business. Visit 1 of our 2 showrooms to learn more about our outdoor home or commercial furniture or check out our selection below!